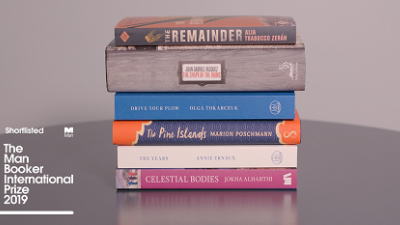 The shortlist for the 2019 Man Booker International Prize has been announced. The Remainder (Alia Trabucco Zeran, trans by Sophie Hughes, And Other Stories). Chosen from a longlist of 13, the shortlist is dominated by independent publishers and includes work spanning five languages (Arabic, French, German, Polish and Spanish). The Man Booker International Prize is awarded to a book translated into English. Prior to 2016, the prize was awarded biennially to a body of work. The £50,000 (A$91,620) prize will be shared equally between the winning writer and translator, and each shortlisted author and translator will also receive £1000 (A$1830). The winner will be announced on 21 May. For more information about the prize, see the Man Booker website.